China Economic Review, the academic journal dedicated to research on the Chinese economy, has published a research article co-authored by a Peking University HSBC Business School (PHBS) faculty member. “Real Estate Prices and Firm Borrowings: Micro Evidence from China,” by Pu Chen of Renmin University, Yangyan Liu from China Merchants Bank and PHBS assistant professor Chunyang Wang, investigates how real estate price shocks affect Chinese firm’s borrowings by ownership type. Generally, the issuances of bank loans are primarily based on two factors: one is collateral, such as real estate and other fixed assets that a firm holds, and the other is the firm’s future profitability. In China, however, due to the dominance of the state-owned banking system and underdeveloped institutions and financial markets, most loans are issued by evaluating firms’ collateral holdings rather than their future profitability. China’s booming real estate market has intrigued many researchers who have begun to study the relationship between asset prices and firm’s borrowings (collateral effect). Some argue that a real estate bubble will undermine a firm’s growth by crowding out efficient investments while others think that firms can get more loans and invest more when their collateral values are on the rise. Nevertheless, much previous literature has confirmed that China’s state-owned enterprises (SOEs) receive a large share of bank financing because of their political connections while private firms rely more heavily on alternative financing channels. Consequently, compared with SOEs, private firms are more likely to experience credit constraints. So how does the real estate boom and bust affect the firm-level credit allocation in China? To address this question, professor Wang and his colleagues use a large and diversified sample of Chinese firm-level data merged with city-level data on land price and housing prices. The data covers 411,430 industrial firms including SOEs and non-SOEs and a total of 1,934,072 firm-year observations over the period 1999-2007. In addition, land supply elasticity and interest rates in China are also used in the estimation in that the price elasticity of local housing supply and mortgage interest rates are vital factors to determine real estate prices but are not directly related to firms’ borrowings. The land supply elasticity and local housing price elasticity refer to the percentage changes in land supply and local housing demand when there is one percent change in their prices respectively. 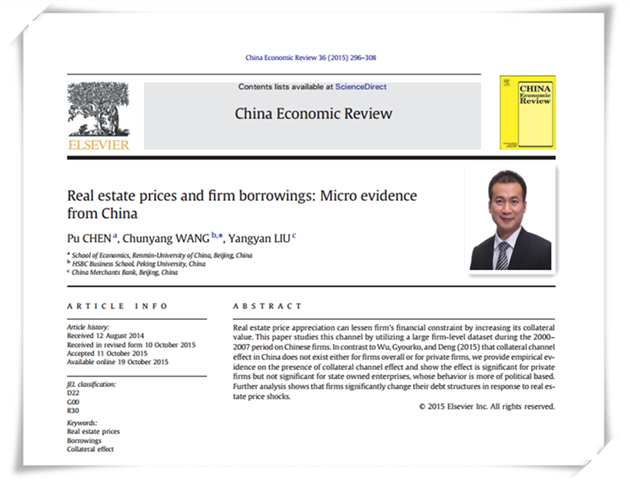 Moreover, researchers employ empirical methodology to analyze the impact of the real estate price change on firms’ borrowings and debt structures so that they can determine whether a high asset price increases a firm’s borrowing capacity in China and whether the effect is different for SOEs and non-SOEs. Further, in a regression where we use some variables (explanatory variables) to explain a certain variable (explained variable), endogeneity problem will occur if there are omitted explanatory variables or measurement errors in the explanatory variables. Since the real estate price is the key explanatory variable in this research, endogeneity problem will emerge if there are some unobservable macro- or financial factors that could affect both loan issuance and real estate prices. To solve this problem, this research uses the interaction of local housing supply elasticity and long-term mortgage interest rate as an instrument for real estate prices. The research findings show that real estate price appreciation has a significant positive impact on a firm’s borrowing in terms of loans and debts, but is only significant for private firms. The empirical findings confirm the existence of a financial constraint on the collateral channel in China. SOEs, which have easy access to bank loans due to their political connections, are not credit constrained. Private firms, however, have to finance their investment projects mainly by pledging their collateral because of the credit constraint. Additionally, there are huge increases in the firms’ leverages corresponding to the real estate price appreciation, which implies that real estate shocks have an impact on Chinese firms’ debt structure. The appreciation in collateral value is indeed helpful to ease the firms’ financial stress. Compared with other researches that have also studied the collateral effect, this research uses data from the Chinese capital market, which provides a better experimental field for the study due to its unique bank-oriented characteristic. Apart from that, the sample in this research is large and well-diversified. The firm-level data mainly consists of private firms that have no equity financing channel, which will help the researchers gain a better understanding of the borrowing constraints in China.